Amy's Creative Pursuits: Got Flowers?! Hello! I'm playing Vicki's Flashback Friday Challenge again this week and this time her theme is flowers. Every week Vicki from 'Stamp Smiles' challenges us to use our old, neglected, retired supplies in a trendy new way. I told Vicki all I have is old stamps, so that's never a problem for me! Well you all know I love flowers, so this week's challenge was a treat for me. To make my card I pulled out the retired Stampin Up! set "Delight in Life". My pretty paper is from DCWV 'Lemon Flower'. It has a lot of texture and sheen in real life. To make the card, I stamped the flowers from the set on separate card stock and cut them out. The sentiment was stamped directly on a banner cut with an MFT die. I colored the little yellow flower in the sentiment with my copics. Little yellow adhesive crystals were added to the center of each flower for embellishment. It was a fun and easy card to make, and I really loved using my old SU! set again. If you'd like to play along with us this week, just click the link at the top of this post. These cards turned out so pretty! You have a great talent for making these. Do you have an etsy shop? If not - you should! 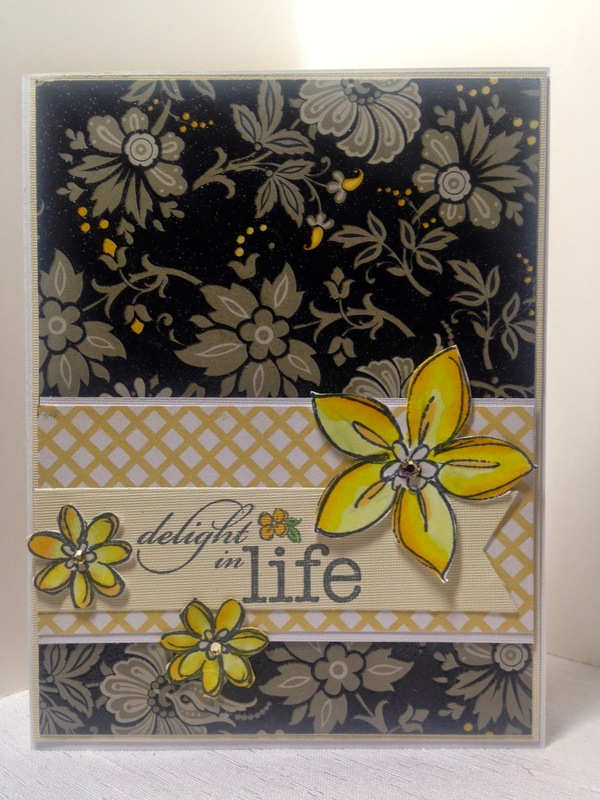 A fabulous color combo, this card is a beauty Amy ! Hi Amy! I came over here from Vicki Flashback Friday challenge post and just wanted to let you know that I very much enjoy your card and post! 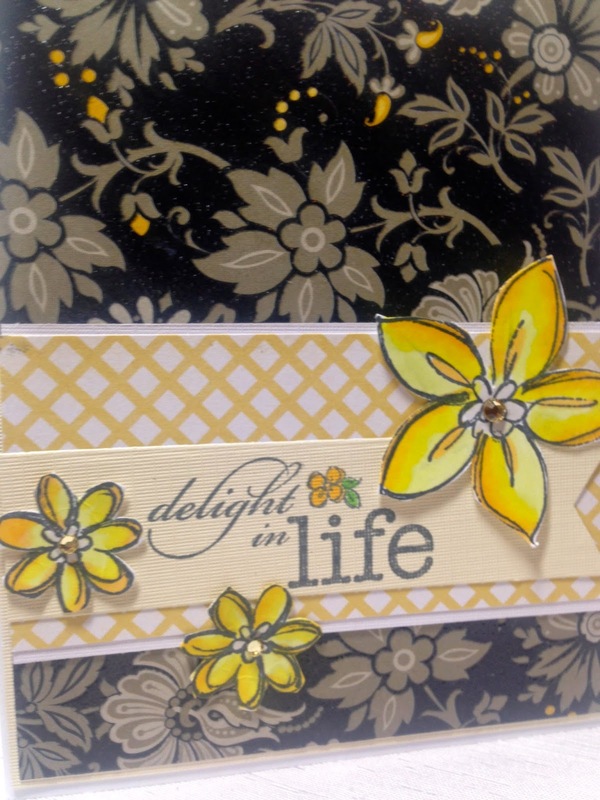 I love the pop of yellow against that pretty black patterned paper! Just gorgeous!! :) I am also a flower person, so I love that this challenge was perfect for us! Have an awesome Wednesday! Loving that patterned paper! Gorgeous card Amy.